Recently, Volunteer Coordinator for the BLC, Lisa Brown, sat down to interview Hue Gioi, a practicing Buddhist monk about his volunteer experience at the Boston Living Center. Hue Gioi has been offering meditation classes at the BLC on Tuesday afternoons for the past few weeks. I was inspired by my sister. She had a little bit of a wild side, and after college she moved to Hawaii. She had this long beautiful blond hair, and when she came back she had shaved her head. She was really different, she was centered and strong and she had been practicing meditation. I was about 16 at the time, and it had a big effect on me. I used meditation for about six years to support my acting, before and during college. I wanted to be an actor because I was interested in people. While acting and meditating I became more and more interested and just before I was going to head to LA to pursue my acting career, I decided to go on a retreat to find out who I was. I had met a monk who embodied what I had been studying and practicing. I was going to be on my retreat for three months and that turned to six months, and I realized it takes a lifetime. I found this life very fulfilling and decided in about six months that I wanted to become ordained. 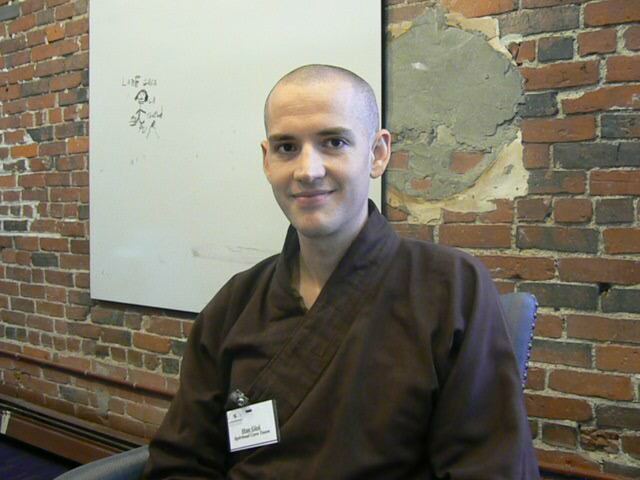 I’ve been a practicing monk for almost six years now. Why did you choose to offer your skills to the BLC? I had wanted to volunteer, and as a child I had been sick a lot and in the hospital repeatedly with illnesses, being ill had been a big part of my life. While I was in Burma I contracted typhoid in the jungle and had to be rushed to the hospital alone from the monastery. There had been a cyclone and the hospital was very rustic and had no windows, allowing in rain and flies. Food was not provided by the hospital; a monk had come to stay with me and slept on the floor. However, strangers offered their help to me bringing food, some ladies came by to sing to me and rub my feet. I also helped myself by meditating, it’s a great way to help become calm and it’s an easily learned skill. I promised myself to help others in similar situations. How long have you been practicing and teaching meditation? I’ve been practicing for about Four years and teaching for about two years. Well putting aside the fact that someone who has HIV; meditation can be helpful for anybody who is under any stress. It helps you to be able to center yourself, to come back to yourself, and to calm down in many kinds of difficult situations. Specifically with people with HIV or sickness- any other illnesses…Meditation has been shown in different studies recently to boost the immune system, and to elevate your mood, and I think these are two factors that play a really important role, not just…you know, in keeping somebody healthy but in somebody’s quality of life. And I think that’s what I’m interested in helping…because I can’t do it, I can’t meditate for somebody else, but helping others to kind of help themselves and enriching their quality of life. What do you enjoy most about working with the membership of the BLC? The overall support and care and appreciation within the staff- and members are also appreciative, and there is an earnest…honesty of trying something new and different. There is a mutual respect throughout the center- everyone helps everyone- teacher, student, staff and guests. Anything else you want people to know about Buddhism or Meditation? If there is one thing I want people to know it’s that- no matter race, or religion, or beliefs, you can practice meditation to deepen your religion or your knowledge of self.